How long does retinitis pigmentosa last? What are complications of retinitis pigmentosa? What is the prognosis for retinitis pigmentosa? Where can I find out more information about retinitis pigmentosa? Retinitis pigmentosa is a bilateral inherited condition that involves both eyes. It usually starts later in life and progresses to blindness. Low-vision rehabilitation provides some help in coping with the condition, but there is no treatment or cure at this time. Since retinitis pigmentosa begins as rod degeneration, the patient first notices increasing difficulty in night vision, followed by difficulty seeing in the periphery. Slowly progressive constriction of the visual field leads to tunnel vision. A small area of central vision in both eyes usually persists for years. Generally night precedes tunnel vision by years or even decades. Total blindness eventually ensues in most cases. The age of appearance of legal blindness ranges from as early as childhood to as late as the 40s. Since retinitis pigmentosa begins as rod degeneration, the patient first notices increasing difficulty in night vision, followed by difficulty seeing in the periphery. Slowly progressive constriction of the visual field leads to tunnel vision. A small area of central vision in both eyes usually persists for years. Generally night blindness precedes tunnel vision by years or even decades. Total blindness eventually ensues in most cases. The age of appearance of legal blindness ranges from as early as childhood to as late as the 40s. Although the history (especially the possibility of retinitis pigmentosa appearing in other family members) and complaints of the patient may make one suspect RP, it is primarily diagnosed by examination. The patient may complain of difficulty seeing at night or in low light condition. At some point, the ophthalmologist observes relatively characteristic clumping of pigment in the retina in a pattern described as resembling bone spicules. Fundus examination (looking at the back layers of the eye with the ophthalmoscope, an instrument allowing the visualization of the back of the eye by looking through the pupil) affords the view of the retina. A similar pattern may appear in congenital syphilis which is unrelated and must be distinguished. Two tests are essential in the diagnosis and the follow-up exams. Visual field testing will find defects in the peripheral (side vision) with the degree of loss related to defects in relation to the damage occurring in this disease. Over time, the visual field may reduce to a small central island of vision causing "tunnel vision." The final progression may be the complete loss of the remaining central vision. Electrophysiological testing by the ophthalmologist (often by referral to a university ophthalmology department, since very few private offices would have this equipment) is often diagnostic. Responses to flashes of light are measured via electrodes placed on the surface of the eye. It is a painless test. The electroretinogram (ERG), in conjunction with the visual field exam, will usually make the diagnosis. This will also determine if there is any cone involvement. Recently, gene testing for defects is being done to clarify the basic cause for RP and assist in ultimately finding a treatment. As of now there is no specific cure for retinitis pigmentosa. For years, vitamin A therapy has been recommended for many RP patients, based on research dating back to the early 1990s. A randomized, controlled trial of vitamins A and E found that 15,000 IU a day of vitamin A palmitate could slow the course of the condition among adults with typical forms of RP. Vitamin E, however, at a 400 IU a day dose appeared to have an adverse effect on the course of RP in the same study. Another study among adult patients with RP has shown that an omega-3-rich diet containing docosahexaenoic acid can further slow disease progression. Such a diet includes one to two 3-ounce servings per week of oily fish such as salmon, tuna, herring, mackerel, or sardines. Researchers estimated that the combination of vitamin A plus this diet could provide almost 20 additional years of useful vision for adults who start the regimen in their 30s. It is important to make a diagnosis so that the patient and family may be counseled as to the status of the disease, what the patient may do, and what low-vision treatments (in more advanced disease) might be available to allow maximization of the patient's visual potential. Low-vision services will be very helpful in coping with the disease. This low-vision therapy may be provided in the eye specialists' offices or by referral to a low-vision center. As the visual field constricts, efforts are being explored for the use of visual field expanding glasses. If cataracts occur, they may be removed as in other patients with cataracts, usually with the use of an intraocular lens. It lasts a lifetime, with blindness often occurring if one lives long enough. Cataracts occur at a higher incidence in RP patients. If the cataracts are significant, cataract removal can be performed surgically. 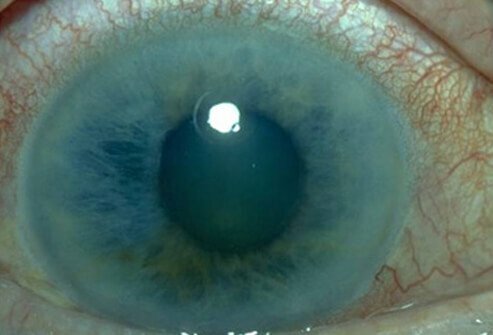 When cataracts occur, patients respond well to cataract removal with implantation of an intraocular lens. However, this does not improve retinal function. The ultimate complication of RP is blindness from loss of retinal function. Recording for the Blind, Inc.
American Academy of Ophthalmology. "Section 12: Retina and Vitreous." 2010-2011 Basic and Clinical Science Course. San Francisco: American Academy of Ophthalmology, 2010. 228-236. Please describe the signs and symptoms associated with retinitis pigmentosa. What treatments have you or someone you know received for retinitis pigmentosa? Please discuss the complications associated with retinitis pigmentosa. These fats may help reduce the risk of ventricular fibrillation and sudden cardiac death. There are three types of Usher (Usher's) syndrome, the most common condition that affects both vision and hearing. The major symptoms of Usher syndrome include retinitis pigmentosa (night-blindness and a loss of peripheral vision), and hearing loss. Usher syndrome is a genetic condition. There is no cure for Usher syndrome.